Karim Benzema (right) slides his shot past Claudio Bravo to score Real Madrid's third goal against Barcelona in Saturday's El Clasico. Pepe celebrates after giving Real Madrid the lead at the start of the second half. The defender's header was his first goal against Barcelona. 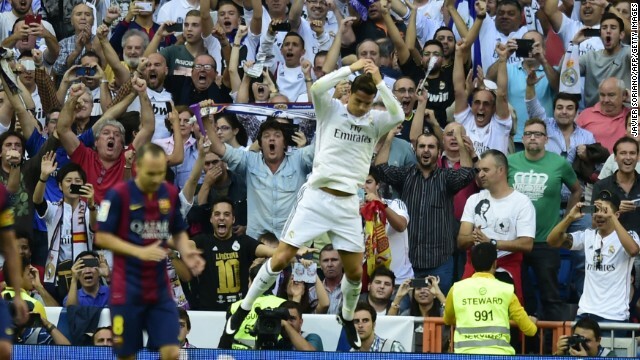 Cristiano Ronaldo celebrates scoring Real Madrid's equalizer in front of an ecstatic home crowd. His 35th minute penalty brought an end to Barcelona keeper Claudio Bravo's record of eight clean sheets in the opening eight matches of the La Liga season. 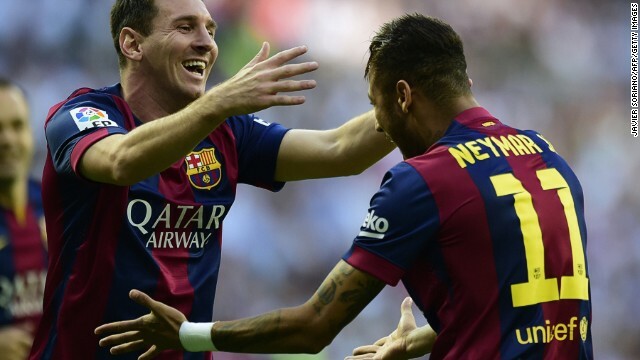 Lionel Messi (left) congratulates his teammate Neymar. The Brazilian striker opened the scoring for Barcelona in the 4th minute against Real Madrid at the Bernabeu on Saturday. Luis Suarez warming up before the 169th El Clasico. The Uruguayan started the match and immediately made an impact providing the cross from which Neymar scored the opening goal. 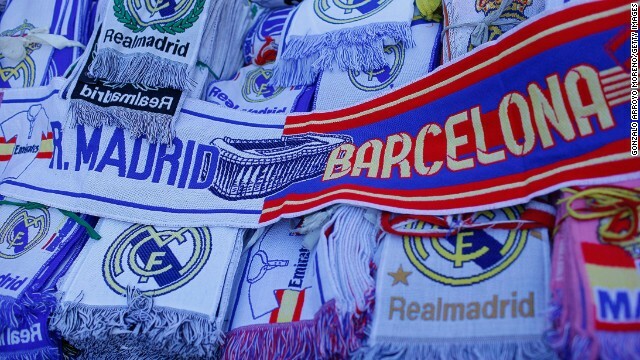 A sea of El Clasico scarves on sale outside the Bernabeu Stadium before Saturday's match. 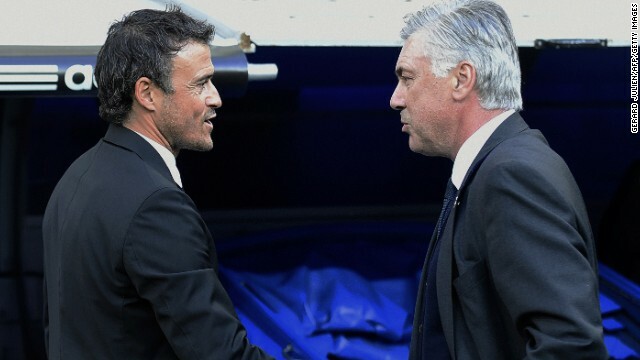 Barcelona coach Luis Enrique (left) talks with Real Madrid's Italian coach Carlo Ancelotti before the match. (CNN) -- Real Madrid ended Barcelona's unbeaten start to the La Liga season with an emphatic 3-1 victory at the Bernabeu in the first El Clasico of the season on Saturday. Luis Suarez started his first competitive game for the Catalan club after completing a four-month ban for biting Giorgio Chiellini at the World Cup but was powerless to stop a frequently rampant Real Madrid side. Suarez, who arrived from Liverpool for €82.5 million ($105 million) in the summer, immediately showed what offensive bite he could offer his new employers when he provided an assist for Barcelona's opening goal in the fourth minute. His looping cross from the right fell at the feet of Neymar who then sprinted unchallenged along the 18-yard line before drilling a low shot past Iker Casillas. Messi could and perhaps should have doubled the lead in the 23rd minute when Suarez again slung in a dangerous low ball from the right. But the Argentine, who needs one goal to equal Telmo Zarra's all-time La Liga scoring record of 251 goals, contrived to shoot directly at Casillas who deflected the ball behind. It proved to be a costly miss as the home side grew in stature and after some near misses -- Benzema hit both the post and the bar with separate attempts -- Real got their reward when Gerard Pique used his arm to block Marcelo's cross from the byline. The referee pointed to the penalty spot and Cristiano Ronaldo duly scored, sending Claudio Bravo the wrong way and ending the Barcelona keeper's record run of 755 minutes without conceding a goal. The home side carried the momentum into the second half and took the lead five minutes after the break when Pepe headed home from a corner before Karim Benzema finished off a superb move in the 61st minute. It was a goal that exemplified Real's hunger and counterattacking qualities as the ever industrious Isco stole the ball from under the noses of Andres Iniesta and Javier Mascherano on the left touchline. The 22-year-old then slipped the ball to Ronaldo who in turn squared to James Rodriguez who then offloaded a perfectly weighted ball into the path of Benzema who finished the move in style. There was still time for Barcelona to come back but it was the home side who perhaps should have extended their lead as the visitors pressed forward. Suarez was replaced by Pedro in the 69th minute but a pair of fresh legs in attack failed to kick-start a revival. Victory for Carlo Ancelotti's side sees them move up to second place in the table, one point behind Barcelona who remain on 22 points. "We didn't lose our head after losing the early goal," Ancelotti said. "I liked many things about the team, above all the high tempo we played with. The team recovered well with just two days rest after Wednesday and played very well," he added referring to the Champions League trip to Liverpool in midweek. For Suarez, the return to action left a "bittersweet" taste in the mouth. "I am very happy to return to playing, it is a great relief to have this time behind me," the Uruguayan said. "The feeling is bittersweet because of the result but this team has lifted itself many times before." Read more: Was it wrong to ban Suarez?